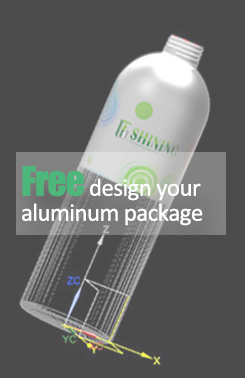 Shining aluminium packaging co., ltd, is china leading manufacturer of aluminum aerosol cans, aluminum bottles, and other specialty aluminum packaging for global consumer brands in the food & beverage, cosmetic, pharmaceutical, household and industrial market. Our bottles are made of virgin aluminum which is 100% recyclable, making it eco-friendly. The one-piece aluminum construction and customized shape of our bottles and canisters, offer a feeling of originality and exclusivity. The containers are virtually unbreakable and for all-purpose use, available in capacity ranging from 10 to 1,500ml, even larger if required. The epoxy resin inner coating makes them corrosion-resistant and non-toxic, and have already passed LFGB,SGS and FDA test. Our facilities are equipped with high quality machineries from Mall+Herlan, and Hinterkopf, we can assure you that we only produce the best quality products.